This chant from Happy Valley Student Book 1, Unit 5, follows the Apple Chant by adding the language chunk It's a. After Storytime, do the Apple Chant, the It's a Chant and then this chant. Do it a second time with the same gestures you did for the Apple Chant. After, give the students paper and colored pencils. Tell them to draw one of the fruit and then show and tell the class It's a banana. Do the chant again, using students' drawings instead of flashcards or the video. Otherwise, check the free-to-download New Routines and Games Bank on www.happyvalley.tv and the free Lesson Plans for game ideas appropriate to the week you are teaching. This chant from Happy Valley Student Book 1, Unit 5, follows the Apple Chant by adding the language chunk It's a. After Storytime, do the Apple Chant, the It's a Chant and then this chant. Do it a second time with the same gestures you did for the Apple Chant. After, give your child paper and colored pencils. 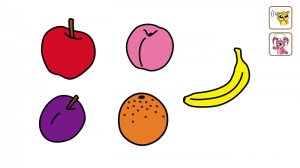 Tell them to draw the fruit and then tell you what each one is using the chunk It's a. Do the chant again, pointing to your child's drawings. See Simon in Tokyo on November 18, at the ETJ Book Service International seminar on ‘Materials and Approaches for Teaching Children’! He’ll be presenting on a hybrid approach to teaching reading, and how to start your own school. Sign up here!